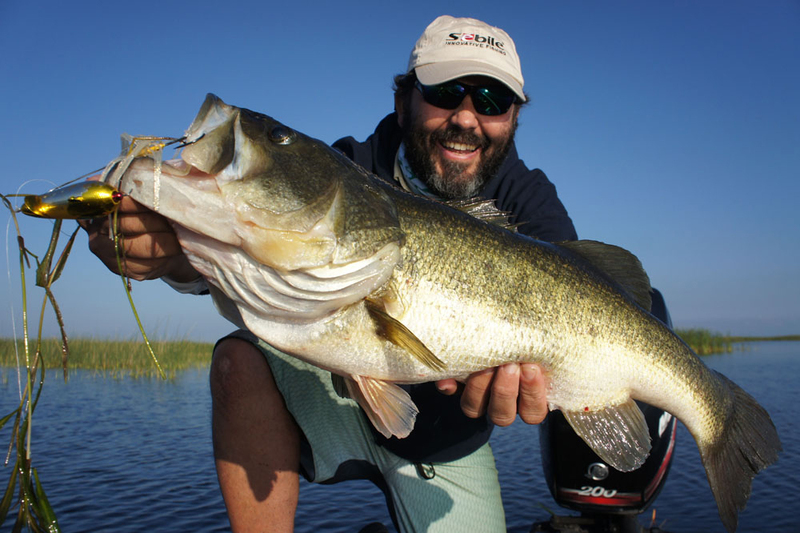 Patrick Sebile has fished all across the world and holds many IGFA records. On a recent trip to Lake Okeechobee, Fla., Sebile set out to fish his way into the record books once again and succeeded on the trip using a lure he designed called the Sebile Proppler Buzz. Sebile connected using the lure on a 61 cm (24.016 inches) largemouth bass, besting the previous record of 59 cm (23.228 inches). 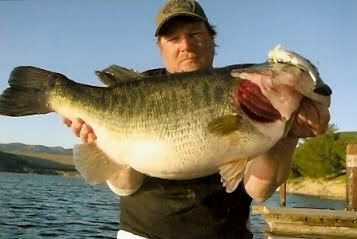 The catchholds the title for the IGFA All-Tackle Length Record for largemouth bass. 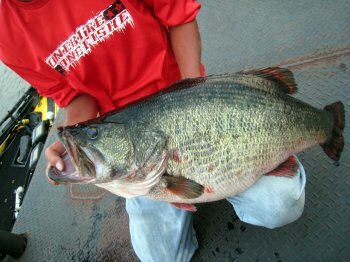 This just has to be the biggest Bass yet "caught", photographed and released! 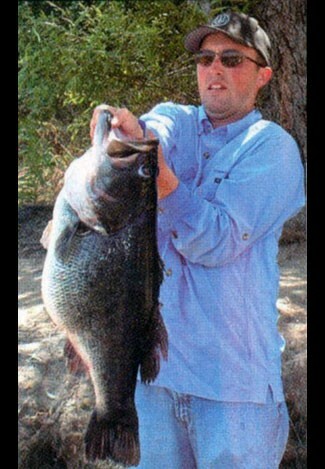 Mac Weakley foul-hooked this massive Bass (25.01lb or 11.37kg) on 20 March 2006, in Lake Dixon, California, USA. The Bass is held by Mac's buddy, Mike Winn. 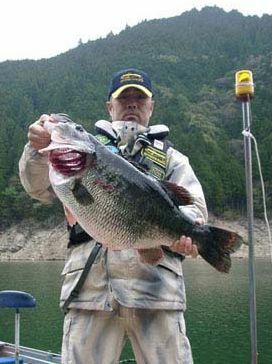 This Bass is not the new World Record Bass as it was foul-hooked, but shows to what size a Bass can grow! Jed Dickerson of Carlsbad pulled this absolute dream Bass from Lake Dixon in Southern California - the weight, an amazing 21.7lb! This monster was taken on the morning of 2 June 2003. 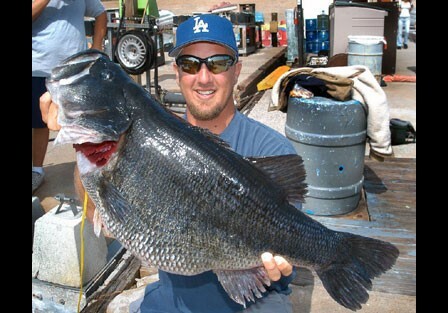 Dickerson, a 30-year-old fanatical big-bass fisherman, caught and released this Bass, the fourth-heaviest on record in the world, the third-largest in the State of California and the heaviest ever in San Diego County's rich bass-fishing history. "Way to go, Jed!". The lure was apparently a Mission Fish Swimbait! An amazing example of "Catch and Release" working! 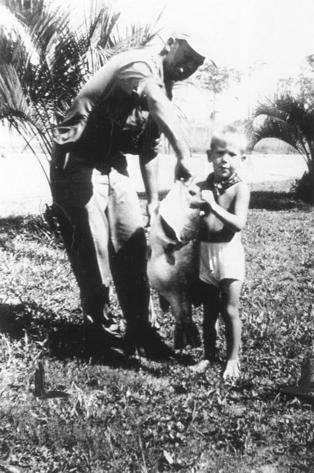 Before anyone kept track of world records, the man on the right, Frederick "Fritz" Friebel, had the world record for largemouth bass. 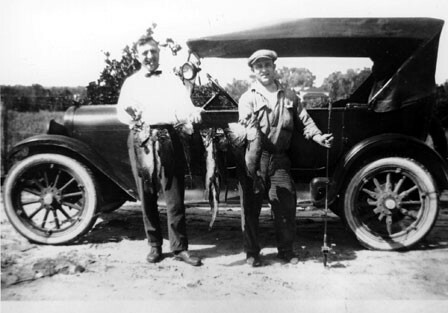 His fish, caught in Florida from aptly named "Big Fish Lake" in 1923, weighed 20 pounds, 2 ounces. 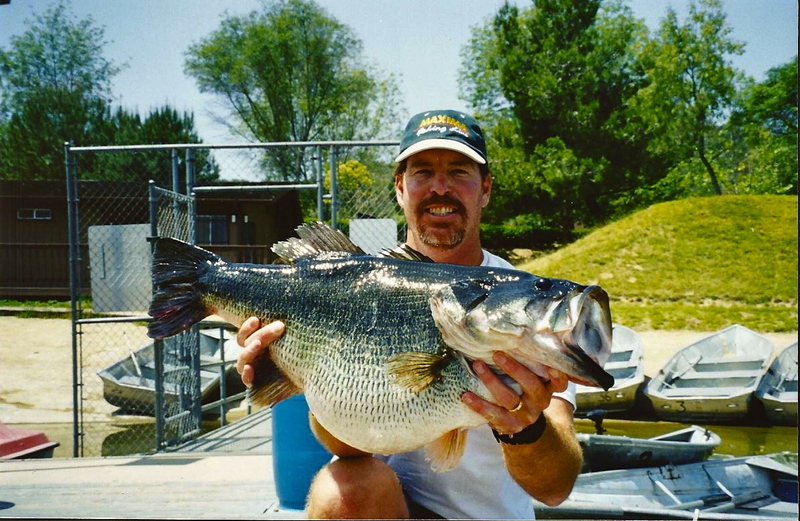 On April 21, 2001, Mike Long, a well acclaimed big bass angler, caught a 20 lb, 12 oz. largemouth at Dixon Lake using a swimbait, which ranks at number 9 of all record largemouth bass. 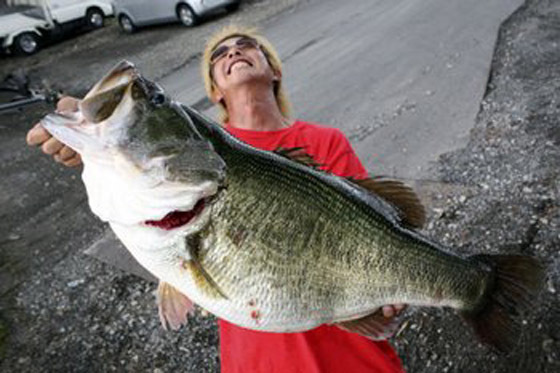 On July 2nd, 2009 Manabu Kurita caught the 22 pound, 5 ounce Largemouth Bass, in Lake Biwa in Japan. The bass measured 29 inches in length. It was caught on a live bluegill. This bass weighs one ounce more than the existing world record. 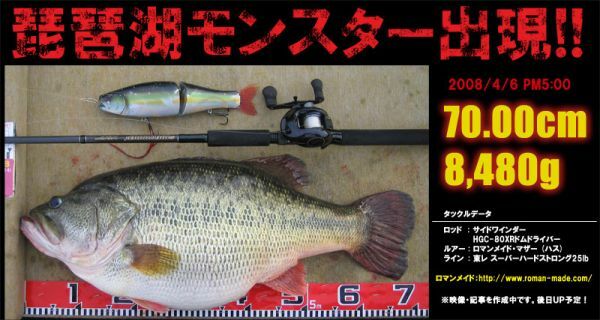 Because Kurita's bass did not beat the existing world record by at least 2 ounces it does not become a new world record, but is considered tying the record. Another Biggie from Japan! 18.66lb! 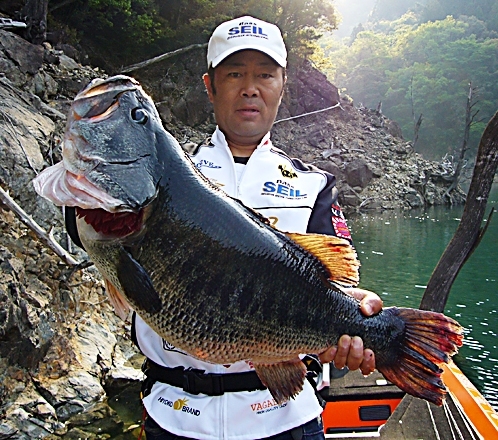 This monster of 18.66lb (8.48kg) was caught at Lake Biwa, Japan, on 6 April 2008 by t he holder of the current Japanese Record Bass and joint World Record Bass, Manabu Kurita. Check out that girth in relation to the length! 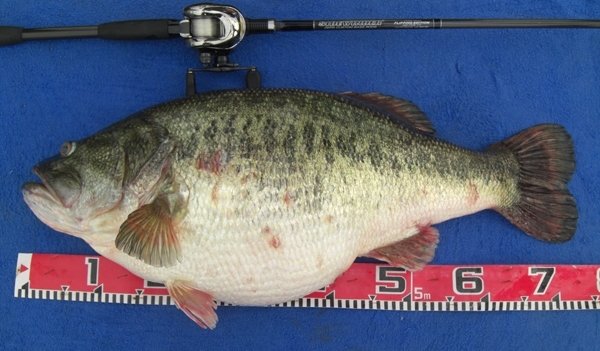 So now you know why you just cannot trust those popular length/weight tables, especially when it comes to big Bass! Mac Weakley added to the reputation of tiny Lake Dixon in California with this 19-7 in May 2003. Two years earlier Dixon had given us "Dottie," Mike Long's distinctive 20-12 catch. Eleven days after Weakley's 19-pounder, Dottie would be caught again. Butch caught this 19.3lb beauty early in 2008 (at Castaic Lagoon, California) on a Huddleston Deluxe Trout. A big Bass from Mexico! 18.3lb! 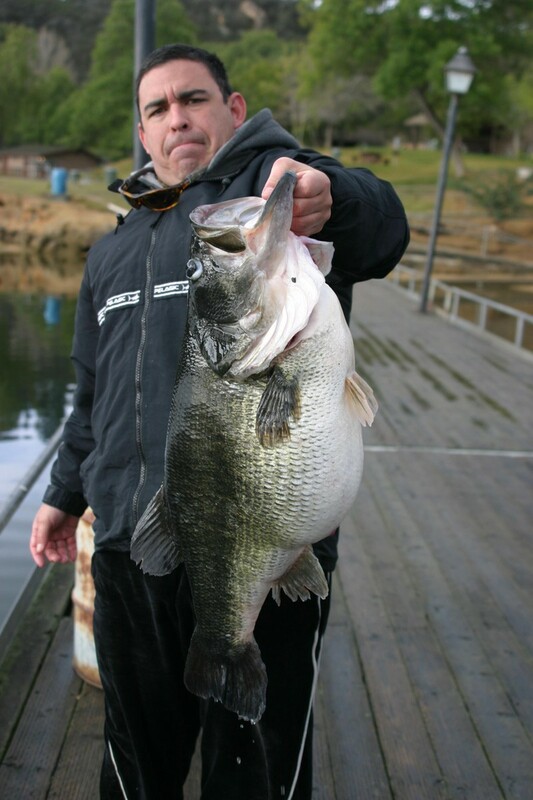 This magnificent 18.3lb Bass was caught by Mike Hutcherson of Plainview, Texas, while fishing Lake Baccarac in Mexico on the afternoon of 13 February 2005. The Bass took an 8" watermelon Lizard in 14ft of water. These facts are not approved by any committee! So if wrong, please correct me.